Easy Project and Task Management Tool. An easy project collaboration tool for dynamic team or for organization. Add your project with name of project, add description, choose category and project cost, add end date, add project files or media of project and assign to team members and client. This project invitation goes to your client and assigned user to get start project communication. Project is you can run for multi task and milestones operations with many team members who works in different tasks. While adding project you can add team member at a time or later on when you wish.You can also add many users to work with project collaboration. Run your task under project or separate with user controls. If you have a big project and in that many team members are working under particular task of that project, then you can add task under that project within deadline of the project and assign to respected user you wish for that task work. Even more, if you have individual task (not under any project) that you wish to complete with team user, then you can create task without selection of any project and assign to team member to do work on that task.Task is you can use for one to one communication in internal team to track the task reporting. Assign custom roles and rules for every team member. According your organization you can add user roles like manager, marketing etc., with particular access of the project board like add, edit project, task, user and create invoice. If you are IT Company you can add roles like project manager, web developer, web designer etc. Same way if you are HR Company you can add roles of hiring manager, accountant and placement cell etc., and usages roles for that particular part of operation. Easy billing for projects to get payment online. Creating the project invoice is a very easy and quick. Just go to invoice section, select project for that you wish to create invoice. Add description and amount, add new line for adding more items in invoice, add tax or discount if any applicable, add narration or terms for your information and submit to create the invoice. For one project you can create one or more invoices, like advance payment invoice, first milestone or task invoice and final project invoice. The created invoice goes to client and can able to pay online from client side. Once client pay it will automatic change status of paid. Even you can add manually add client payment and declare it paid. For office account purpose you can also take a print from the pdf file. Get full insights of each project, task and user rating. 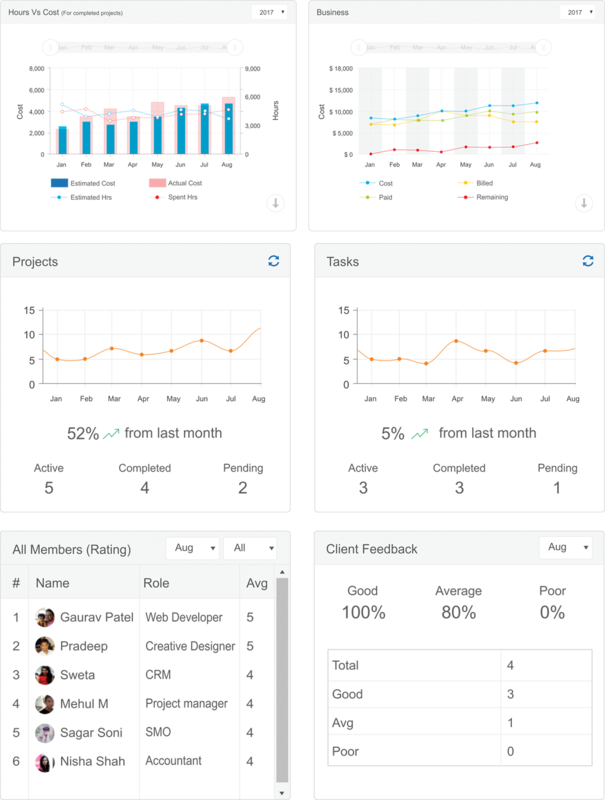 In administrator's dashboard, we have various graphical reports to get an overall work progress, business and team evaluation of an organization. Hours Vs Cost: This bar and line chart give you report of the estimated hours used in organization by all team members and actually spent hours by team members for various project and tasks. Same way you will get report about estimated amount of all team members in organization and actual cost covered from the completed project and task amount month wise. Business: In the line board of the business table it shows the total business done in month by the project invoicing. Also, it will appear the total billed amount, paid and remaining amount status for the month. Projects & Task: Project and task have separate line chart that shows the total active, completed and pending projects/tasks for the month. Also, it compares the numbers with previous month and show the progress in percentage wise. Star Performer & User Evaluation: In this user report section admin get idea about the star performer user of the month and rated user of the month from 1 to 5 star rating. Client Feedback: In this reporting section admin get project feedback received from the client side for the month. So organization gets overall rating for every project from client side. Project Auto Close, Make Duplicate, Get Rating and History in Each Project and Task. Every project and task have start date and deadline to complete work, in this case you can choose auto close on / off. So when you create project or task with auto close on, the project or task will close automatically on the end date and it become status in feedback, and user evaluation mode. In project / task section, you can check the History,Rating and Feedback of theproject / task having “Completed” status. So in completed project/task you will have quick information of the Rating, Feedback, Invoices (For Project Only), User and Client information. We also have another feature to "Duplicate" any project / task with same information and dates interval.